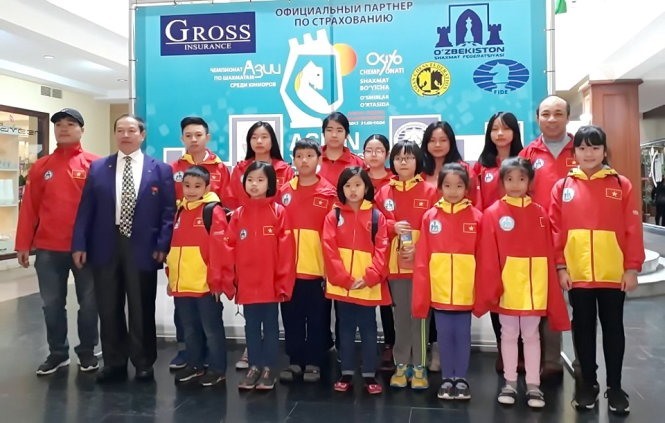 HÀ NỘI — Vietnamese young masters earned four silver medals at the Asian Youth Chess Championships in Uzbekistan yesterday. Hoàng Minh Hiếu was second in the U10 Open’s blitz event, with seven points after nine matches. Sindarov Islombek of the hosts won the gold with 7.5 points. In the Girls’ U12 blitz chess, Nguyễn Thiên Ngân won a silver medal with seven points, while her teammate Trần Đăng Minh Quang finished second in the Open discipline. The last medal went to Bạch Ngọc Thùy Dương in the Girls’ U14 who earned as many points as Indian Jishitha Daghli, but she came in second due to her lower parameter. The Vietnamese masters also earned two bronze medals in blitz chess, won by Phạm Trần Gia Phúc in the U8 Open and Nguyễn Quốc Hy in the U12 Open.